It's the time of year to start thinking about shoes for spring and decisions must be made. Another pair of ballet flats? Yawwwwwwn. Glads? On their way out. Glads with fabric cuffs around the ankles? Ultratrendy! And where ultratrendy goes, there's always victim potential. Finally, there's the fierce high-heeled sandal option, which, forget it, we've got places to get to. Back on the ground, I think the time has come again for an 80s favorite, which, before that, was a several-millennia-in-Central American favorite, the huarache. Which, quite simply, is a sandal with a flat or low heel and an upper of woven leather strips. It is properly pronounced wha-rah-chay, but some of you will insist on pronouncing it hurrah-chee. 1) Go for a new or barely-worn pair (this is of course the usual advice for vintage shoes but is extra important with sandals, for the obvious reason that there has been no barrier between foot and shoe). 2) Bear in mind that the leather will stretch to an extent, so be extra careful in the size/measurement regard. 3) Determine in advance how wide the shoes are. If they are too narrow, your little toe will try to escape through the weave and this will drive you nuts. If they are too wide, your toes will not be able to curl properly, you won't be able to walk naturally, and subconsciously you'll reach for another pair of shoes every time. 4) Look for quality old brands and intricacy of weaving. Ask the seller politely but firmly about whether any part of the shoe appears to be structurally unsound. Now, on to the happier subject of how to wear your huaraches . . . Easily enough, the answer is pretty much any old way you choose. Their native comfort and dress-down style make these go-to shoes in the summertime. As long as they fit right, you will want to have them on all the time. 1) If you're planning to shop into this summer's military trend in a big way, go for brown or tan. 2) If you insist on clinging to your black leggings (don't do it!!) black ones are the way forward. Do not fool yourself into believing that these will be more formal than the brown ones. 3) White ones are adorable, but you've got the issue of keeping them clean. Dingy white huaraches look nasty/manky. 4) They're out there and they're cheap! Go for all three. 5) Socks would be a bold move with a huarache, but since they're otherwise trendy with sandals this summer, do some experimenting. To up your chance of getting it right, wear a sock whose tone acts as a transition between your skin tone and that of the shoe. Ankle socks preferable to anything higher. 4) The open-toe versions looks more contemporary, but a nice pair of closed-toe ones can be quite elegant. Good luck, muchachas. You'll be thanking me come summertime with those happy feet. photo of huaraches at top from the Susie G. Collection, many thanks! Not sure if these are for me, but I'm all in favour of natural fashion, made by skilled craftspeople. And you may have hit upon a hot new trend. Mmmm would never have considered these before as they always seemed a bit like old lady shoes for women or on men they smack of shady Latin spivs! But now regarding them in a new light. Then in our local Shoon store today I tried on these - new in stock for summer! A word of caution: having grown up in the 80s, I can tell you that the huarache is not a durable shoe, so wear it carefully. They very quickly lose their shape and get ratty-looking, particularly as they are prone to "grow" several sizes as you wear them. Start off with a snug-ish pair and they will grow to fit you. Start with a pair that fits you perfectly and they will speedily expand and stretch and become sloppy. These are one-season shoes: toss them at the end of the summer, as they will no longer be smart-looking by then. Good luck! Brilliant advice, XYZ, thanks so much. The life of your Huaraches all depends on the quality of the leather. Huaraches were originally made for farm use and as such had to be tough. 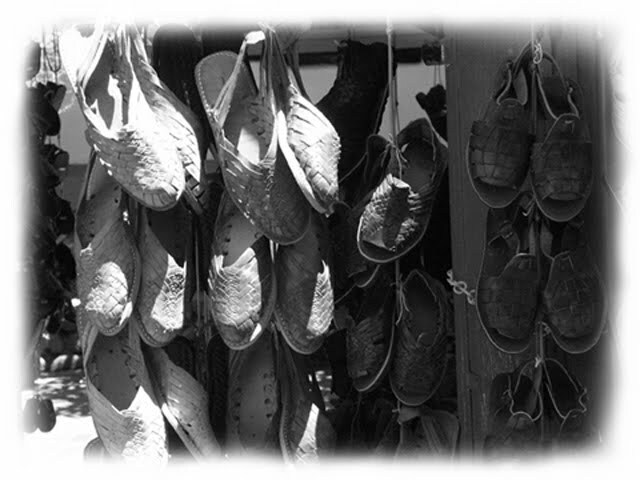 Seasonal Huaraches made with thinner and lower quality leather are typically made as souvenirs for tourists. 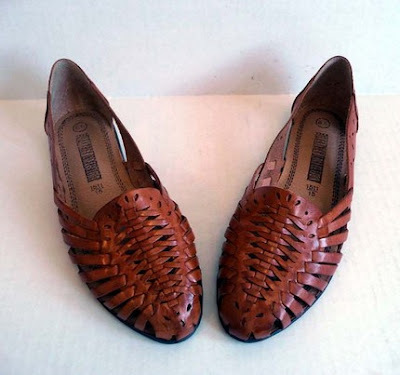 Much of the longevity of your Huaraches depends on thickness and width of the strips of leather. The thicker they are the longer they will last and the less they'll stretch. Also consider buying a Huarache with a lasted heel that will provide a consistently good fit.